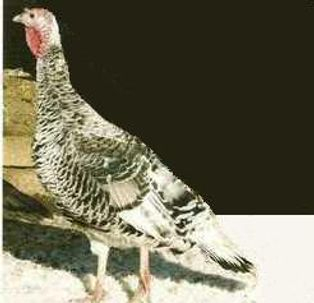 The Light Gray later known as the Oregon Gray turkey variety has been considered extinct for a decade now as the last known pair died back in the late 1990's. 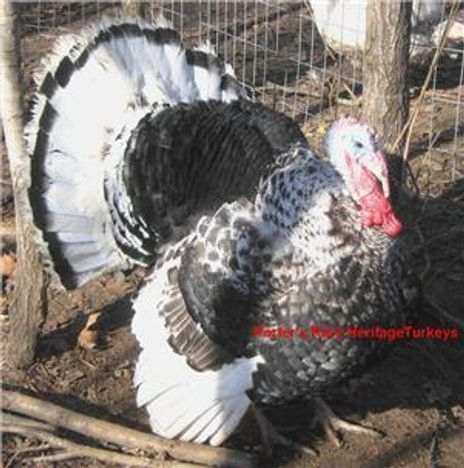 But they can be recreated since the necessary genes are present in several other Heritage turkey varieties. 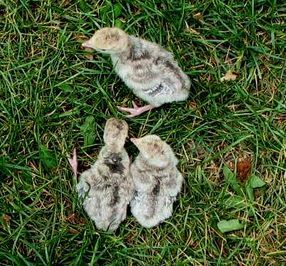 I have been able to do this with an experimental breeding group of turkeys that I call Silver Dapples,which carry all the necessary genes. So now the Oregon Gray is back for a second chance. Oregon Grays have a white base plumage color with black pigmentation about the edges of the feathers. The typical black and white colored barring in the wing feathers appears as a mixing of the two colors without definition. The adult pattern resembles the palm pattern but is different. Toms are a shade darker than hens. At hatch, the gray poult has a yellow-gray down color with dark black or brown stripes on its back. This variety produces three results, Oregon gray, dark gray and white. Approx. Mature Weights: Toms 33 pounds and hens 18 pounds. More dedicated breeders are seriously needed to help get this variety re-established to safe numbers.